“Education is a key that unlocks the creative impulses within human beings and I do not hesitate to say it emphatically” “Education is the process of empowerment of individuals and educational institutions as the Agents of this empowerment”.Recently I completed Master Degree with Major in Finance from BAHRIA UNIVERSITY ISLAMABAD and have now joined family owned educational business as Director(Finance) to assist my elder brother and father who are in this business since 1995.MIIM is an UKAS ISO 9001:2008 CERTIFIED and itself a Diploma Awarding body under notification No. DE-EMIS-10(40)/2010 by Directorate Education Gilgit-Baltistan for their seven districts and is in close contact with the Government for all smooth handling.MIIM is also a Channel Partner with TRADE TESTING BOARD, DIRECTORATE GENERAL TECHNICAL EDUCATION & MANPOWER TRAINING GOVERNMENT OF PAKISTAN for the award of 1 and 2 years diploma in Vocational & Technical education to all on-job-professionals who are academically sound, enriched with practical knowledge, depict excellent employment history, are entitled for the consideration of diploma after appearing “Short Competency Test” or even under Fast Track (FTES) after evaluating the hold and competency of the student. Similarly MIIM is also working as Public Private Partner with SDC Punjab Lahore for the last many years. To my knowledge, believe and practice the award of COMPETENCY BASED DIPLOMA to the candidates definitely facilitate them for promotion in their present status, directing them to the right employment, alleviation in the cadre, family visas, and also an edge to excel with confidence in their profession. 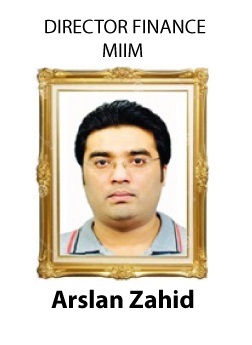 Lastly I am greatly grateful to my colleagues, the technical and support staff and the students from their dedications, commitment, and zeal in contributing towards the development and continued growth of MIIM ISLAMABAD. The meteoric rise of MIIM is a source of pride and satisfaction for all its associates.